This wasn't the post I expected to be writing today, but so be it! I got a note yesterday from my daughter's school. The note said, essentially, we have 21 students, please send 21 Valentine treats by Monday. What? She's in preschool! Do we start this early? I suppose we do - and naïvely, I was not prepared. I puttered and pondered what to do, knowing I wanted low-sugar and low-cost. I considered homemade play-dough but no, too much everything - time, waste, and work. If there is anything my daughter loves more than homemade play-dough it is coloring. Coloring and stickers. Wait, coloring and stickers? For a Valentine? Perfect! A solution was at hand. I delivered the complete set of Valentine treats this morning, with extras. Twenty-five sweet little packets for $1.49 total. Inside each folded piece of paper was a coloring page waiting to be scribbled all over by little artists and a small set of stickers. After I posted my project it soon became clear my friends might want in on the action. Only one problem - I used a quick solution, a piece of artwork from my library that is licensed for personal use only (not for giving away or using in business, just like the license on everything I give away here!). I do love that ornate heart though, don't you? It is from Sarah Paris, if you are simply dying for a copy. Next best solution? All new artwork! I spent the afternoon drawing up a whole new Valentine for you. Yay for a hand done drawing and super yay because my daughter spent her after nap time coloring in all my discarded drawings. A win for all of us! 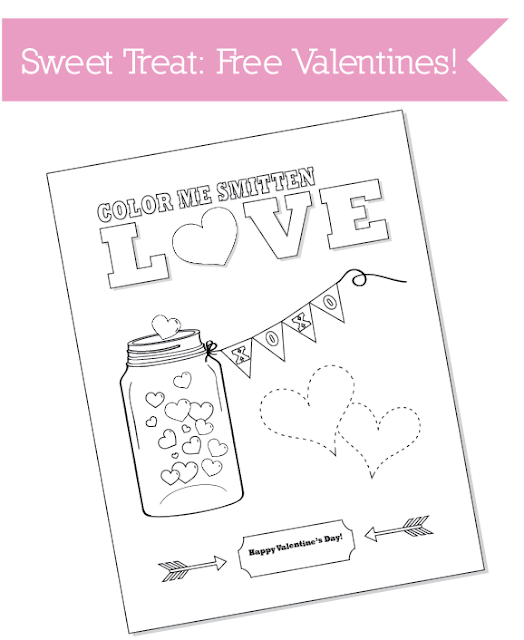 Download your Valentine's coloring page greeting now! Add your child's name in the bottom box by hand or with the writable PDF (more info here if you are confused). Or hey, add your own name and send to your favorite kids! If you would like to enclose stickers like I did go ahead and print this page on the back side of your coloring page. Fold the paper into three (like a letter), then again the other direction - unfold, slip your stickers in the middle, then close back up and seal with a sweet sticker or a touch of tape. Just remember - these files are for personal use only. No selling, using for business, etc! I didn't put any markings/copyright info (though they are copyrighted, obviously) on these pages so I have to say it here, sorry. Hope you, and your little artists enjoy! Lovely! When my little one is suddenly big enough in a couple years time, I'll remember this! Thank you.